When it comes to installing a fence, some people think it’s a good idea to do it themselves. Whether it’s the pride of doing it on your own or the idea of not having to pay for the labor, it can seem like a tempting idea. However, there are a few pitfalls that can lead to many regretting the decision in the long run. What might seem like a simple job, can actually be rather complicated. For an experienced contractor, that’s not an issue. For a first-timer, it could mean hours of lost time and hundreds, possibly thousands, of dollars lost. When people try to show that a DIY fence is cheaper, it’s typically only taking into account the basic cost of the fence materials. It doesn’t include the cost of new tools you might need to buy or how much time you’ll have to invest before you can even start. Here are a few issues that often come up. In order to install a fence, you’ll need a few tools. These are tools you’ll most likely have to buy. Most people don’t just have a post hole digger, batter boards, a nail gun, a level, etc. at their house. And if you already have a fence on your property, you’ll have to demolish it and that could require some expensive power tools to accomplish. Not to mention, you’ll need to make sure you can use these new tools safely and effectively after buying them. You should also think about whether or not you’ll even be using these tools frequently. If it’s a tool you’re going to be using frequently, it could be a great investment. But how many times are you going to build a fence or do a similar project? If you’re only going to use a tool once, it’s simply not worth it. It’ll take time to figure out which permits you might need. Furthermore, if your fence is in violation of any regulations, you may be asked to rebuild your fence or be forced to pay a fine. A digging permit is always required, and it’s important to get one before you even demolish your previous fence. This is so the utilities on your property are marked and potentially dangerous accidents can be avoided. Knowing the regulations of the area you live in is important before you start building a fence, and reading through the laws and regulations is a task that will take time. Another thing to keep in mind is to check if the fence is on a boundary line and whether or not you even have permission to tear the fence down and build a new one. Nobody wants to deal with a legal dispute with their neighbors. Like we mentioned previously, getting a digging permit is required. This is so the utility company can mark the property and make sure that no one is going to accidentally hit a utility line and end up injuring themselves or worse. Removing fence posts is a tough, and potentially dangerous job for someone who is inexperienced. That goes for other parts of the job as well. Whether it’s using a nailgun or dealing with a fence panel falling over, the potential for injury is present throughout the project. A reliable contractor is going to be insured. Would you have the insurance to cover an injury to yourself or a friend who’s helping you build the fence? Between researching what needs to be done, what kind of materials you should use, and what kind of permit you’ll need, you’ll have to put in a sizeable amount of effort before you can even start building a fence. An experienced professional has done this sort of project many times over. Like many skills, you’ll become better and more efficient over time. Somebody who’s trying it out for the first time isn’t going to be able to rely on those years of experience. This will make the installation take much longer. And the final result won’t compare to a job done by a professional. 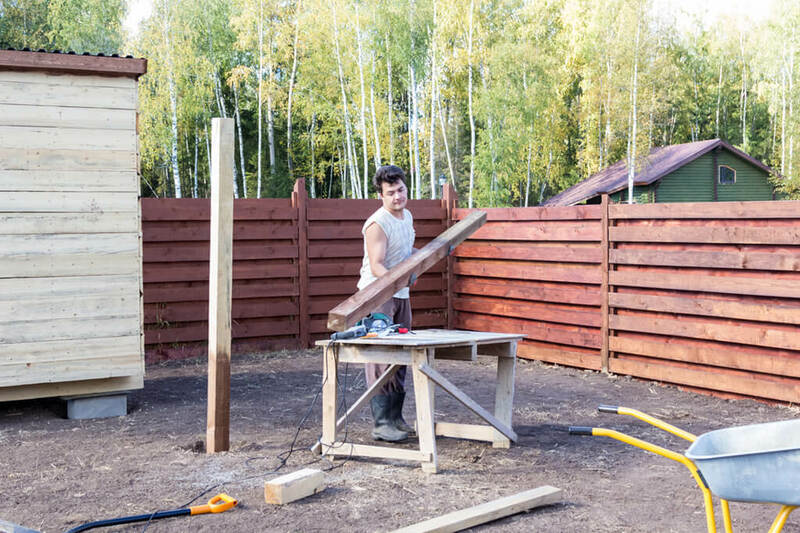 An experienced professional can demolish and rebuild a fence in 1-2 days. That’s not going to happen if this is your first experience with installing a fence. Contractors will have an experienced team with them. There’s a large difference between a team of skilled installers, and someone getting together with a couple of friends to take a crack at fence installation. Depending on your property, you may need to know how to deal with complications like joining new fence to existing structures, dealing with tree roots, retaining walls, or building on hilly conditions, etc. The last thing you want is to spend time and money trying to install a fence on your own and then end up needing a professional to do it after all. Unless you have experience with similar projects or have worked as a contractor, DIY fence installation is a bad idea. While it might seem “cheaper” at first, it could actually end up costing you much more in the long run. There are certainly DIY projects out there that are more accessible for first-timers, but this isn’t one of them.